The preceding excerpt (Hebrews 12:1-2) declaring the presence of a “cloud of witnesses” has been misconstrued in various ways, which will not be addressed here. The imaginary in the letter sent to the Hebrews is rather evident compared to the examples that many have likely come across through our lives. The original intention behind the “cloud of witnesses” was to provide encouragement and call to Christians that had become worn down by the normal struggles faced while living a Christian life to endure through the race. The letter to the Hebrews provided them (and us now) a theological understanding of a Christology of Hope. In the article “When Life Reaches Full Circle,” I discussed how my childhood played a significant role in how I was viewed and expected to act according to standards of a “church kid” and “parental ideals.” I went on to further explain how these standards/ideals harvested internal over an extended period as I walked a path I considered to be safe according to what I considered true. The path that I traveled left me one crimson stain after another as I went. The effects resulted in an over an extended period as I walked a path I considered to be safe according to what I considered to be a truth. I did not realize that every step on this journey was leaving me a crimson stain after crimson stain. The effects of this journey resulted in facing a separation between the biblical truths that I learned as a child, and a genuine relationship with Him had occurred until I faced a decision that was life changing. I mentally checked out of church towards the end of Junior High and in some degrees ignored what I was taught to accept which amounted to altered truths. The phase of checking out did not end well as within about a year, I found myself in a situation that changed my life. I wish this pivotal event had only sent an earthquake through my life, but this decision included others. Thus, some of the side effects rippled to those that I find the dearest. The decisions preceding the linchpin event seemed to add individual dark clouds above me that made me feel like God was not around. I believed He was nowhere to be seen. This belief causes me to hit a point in believing I created my own prison. It is truly difficult to convey the mental and emotional road I went through this time. 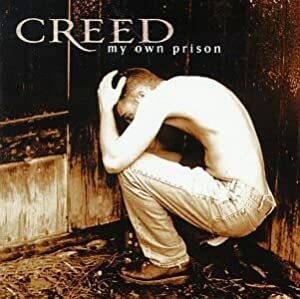 As I spent time deliberating how to put thoughts into words, I could only refer to the song “My Own Prison” by Creed. As a result, I will let it speak for me as it represents this part of the story well. The opening word (wherefore) of verse 1 illustrates that the contents of chapter eleven has been preparing its readers for the proceeding verses. These verses show that His followers are not to “shrink back” (10:39) from their faith to return to face their struggles alone. In my own prison, like others, I had to face the reality that the struggles I faced – and will face – are not intended to push me away. The crimson stains, which caused a separation, did not hinder His desire to have a personal relationship with me and He would never leave or forsake me (cf. Deuteronomy 31:6; Joshua 1:5; 1 Chronicles 28:20). His followers are told to run “the race for which we are entered” (Hebrews 12:1 NEB). It can not be any more appropriate for these verses imagery to be focused on a stadium (cf. 1 Corinthians 9:24; Philippians 2:16; 2 Timothy 2:5) for a culture that causes our attention to be placed on achieving health, wealth/possessions, and glory/recognition. As I have reflected on my own life, I have come to realize that my own struggles have occurred due to my own neglect of Him and not Him leaving. The pursuit of whatever my own personal desire might of been, it resulted in my own decision to slowly take Him for granted. And to ignore the fact that I actually had to make a conscious effort to put my faith into action on a daily basis. In order to do so, it is necessary to lay aside all our excess weight that holds us back from committing fully to running the race (Hebrews 12:1-2). Throughout the Bible, we are told not to be afraid or discouraged. In addition, we are told of His faithfulness despite our fears and shortcomings. We see this common thread in what is referred to as the “Hall of Faith” in Hebrews 11. These men are our heroes of faith which have already run their races and are now in the stands as they are witnesses to the life of faith. These are no mere spectators of our races as they are all collectively extorting each and every one of us to run our race well to the finish. But Its Not So Easy! Each one of us is remain weighed down by the sinful nature of our hearts. The sin that may hold a single follower of Christ is not limited to a particular sin. This is the reason why race imagery is linked to our baptism and the beginning of our life of faith (cf. Ephesians 4:22, 24; Colossians 3:8; 1 Peter 2:1). It is within our nature to naturally default into allowing our inability to overcome our sins ourselves to to become sidetracked and allow fears to engulf our conscious and emotions. We have all gone and listened and allowed out deepest fears to shape our image and expectations of God. Thus, He often becomes smaller than our fears. The nature of heart causes our fears to control our lives. We allow our comfort zones that embrace a risk-free life to be our god. Max Lucado, in his book Fearless, stated that “[w]hen fear shapes our lives, safety becomes our god. When safety becomes our god, we worship the risk-free life.” In short, our desire for a risk-free life becomes more important than God which results in becoming blind to His power over our problems. It is important for us to remember that nothing is to big for God. In “Fear Is Not an Option,” Bryon Bohnert, stated that “[t]he fact is there is nothing too big for God. Even that ominous rock standing in your way looks minuet through His eyes. The size of the mountain is not important to Him.” The fears of our hearts often take a lifetime to eliminate, but it is our faith through trusting Him that starts and finish their eliminate our fears. It must be remembered that the greatest men of faith, whom we can see in the “Hall of Faith,” did not live their lives without having moments of concern. Despite their faith in God, they still found themselves consumed in fear. But their underlining trust in God was vital in overcoming their fears. [W]e’re talkin about a particular sort of trust, not the kind of trust is brainless or blind, because it’s not. And that’s not to say it doesn’t involve any knowledge at all, because it does. It’s just that the primary basis for this trust, this faith, is not so much what you know but rather what God has said. That’s the issue. Hebrews 11:1 clearly describes faith as involving things that have not yet happened (things hoped for), and things that we cannot see. Because they haven’t happened and because we cannot see them, it can be difficult to base our trust on knowledge. So, this trust, this faith, is based on what God said and done, not on what we know empirically or what we have seen with our eyes. The things that cause to individually not to fully trust him are often different for each of us. But the common thread is that each thing comes down to being a desire of our heart. This is the foundation to why the race must not be about how fast we can run, but about our endurance to finish with a victory. The cloud of witnesses play an important role in our race as they give us encouragement and understanding in what we know about God (cf. 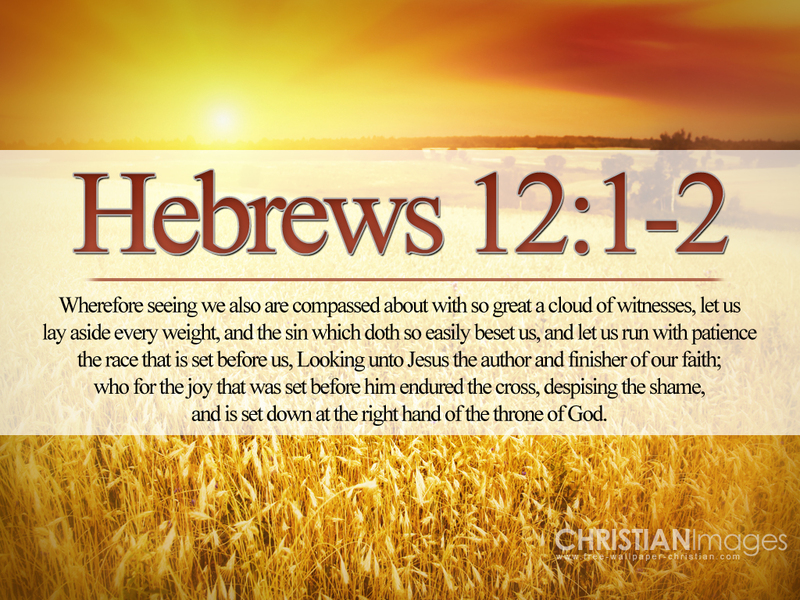 Hebrews 11:1-3). But, it is Jesus that gives us our hope and incentive as we look upon our approaching finish line (cf. Philippians 3:12-14). Moreover, Jesus is the pioneer of our faith because He went before us, and – even to a degree – before the Israel’s hero’s of faith in Hebrews 11. He is our ultimate hero of faith as he not only is a pioneer of faith, but is, also, the perfecter of faith as He trusted God completely, rejected attractions of this world, and endured the crucifixion. The middle of verse 2 (“for the joy that was set before him,” ESV) is best interpreted as “instead of the joy,” which is consistent with Phillippians 2:6-11 (cf. also Hebrews 2:5-18;5:5-10). The whole linchpin to Jesus’ purpose when He endured the cross and overcame death. His life and completion of His ministry makes Him the perfect model of faith as He is the one that enables everyone to run our race with endurance while He is “seated at the right hand of God” (cf. Psalm 110:1; Mark 14:62; Hebrews 1:3).